With dance jumping on the bandwagon of reality TV shows in recent years, dance has gained a profile in mainstream media. Brian Jones looks at the impact these shows have on providing ‘first dance’ experiences for audiences, and if they help to grow long-term and lasting interest in dance. It’s now just over 13 years since dance appeared on New Zealand TV in the format of Reality TV, with the premiere of Dancing With The Stars (DWTS). Prior to that, programmes such as Top Dance in the 80s and Battle of the Ballroom in the late 90s, showed competitive dancers from the Dancesport world competing for a trophy and prizes, much the same as in a regular competition. Dancing With The Stars, in 2005, shifted the focus to a celebrity challenge; celebrities partnered with professional dancers to learn a new dance each week, then perform it for our entertainment. The series quickly became TV1's top rating show from 2005-2009 and continued to rate well for TV3 with their 2015 and 2018 series. Along with seeing some of our top sports people perform against TV and media celebrities, the public actively engage in the show as they vote for who they want to win. They are further drawn in with the back stories; the challenges, frustrations, and hard work that goes into learning the dances. Audiences get a peek into their lives and the charities they’re raising money for. Once the first series aired, some studios, particularly those offering couple dancing, Ballroom, Salsa, Tango, Modern Jive, saw an increased interest in dance, with more people wanting to learn to dance. As the popularity of the show grew, interest appeared to broaden towards dance in general. Alongside this, I noticed through my work in dance, a shift in attitude with regard to seeing males dance. 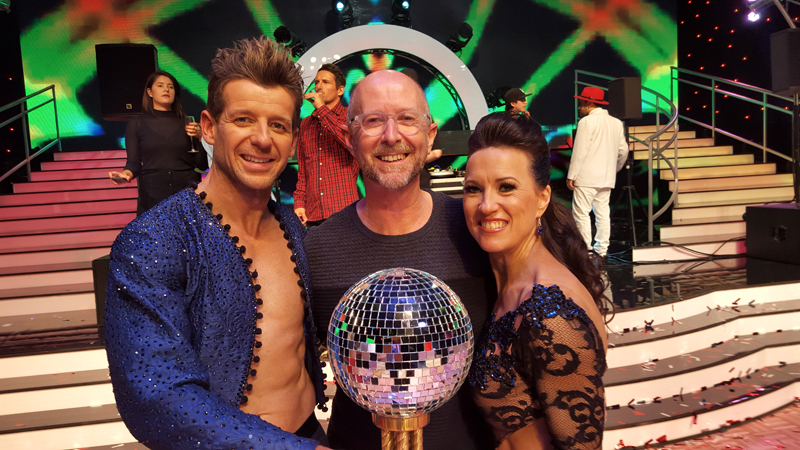 After all, what could be more normalising for young Kiwi male dancers than having former New Zealand All Black, Norm Hewitt, win the first DWTS! Many other influences supported this change, not least of all the popularity of Hip Hop. We began to see groups like TMC, Andrew Cesan and Simon Watt, tap their way into the finals of New Zealand’s Got Talent. Reality TV assisted in increasing the visibility of males dancing. The latest dance show to appear on our screens has been The Great New Zealand Dance Masala. Following the same format of shows like So You Think You Can Dance, young dancers audition and compete, with judges selecting who continues on while giving feedback to the dancers. This time we move into a world fusing Bollywood, Classical Indian dance and Hip Hop. Some of the dancers are trained, others self-taught, with groups, duos and soloists. Screening the show at 4.00pm on a Saturday afternoon rather than a prime-time slot, means it's audience is likely to be more specific. While it doesn't have the glitter of the bigger studio productions, it shows the diversity in dance we have in this country. So, do these shows help grow interest in dance, and who benefits? In answer to the first question I would say, yes. Since dancing on DWTS with Beatrice Faumuina in 2006, I have noticed when travelling through the country working in different areas of dance, a growing interest in dance in its many forms. Studio owners have noticed an increase in enrolments for classes round the time of, or following, the shows. For a period of time, dance is the talk of the town; families at home, in the workplace, blogs and talkback radio. While in cafés I hear conversations about DWTS - who's in the show, who's doing well, who's doing badly, who’s their favourite. It's also interesting to hear opinions on the quality of the dancing, and views on the comments of the judges. Sometimes I've even been approached and asked for my opinion on the show and the dancing. In terms of benefits that these Reality TV shows bring to the dance industry, I would say they provide a great platform for the professional dancers who have the opportunity to appear on them. The show gives them a huge profile. People will know the names of dancers on these shows instead of who the New Zealand Dancesport Champions are. The show gives studios and dancers connected with it a profile that they can use to expand their studio business or provide opportunities teaching in schools. The format of the reality show has also become a popular way for charities and organisations to raise money, or for studios to develop new events to grow their business. Dancing With the Stars Fundraising Challenge held in Christchurch and the Dancing With the Fielding Stars are good examples of communities building on the profile given to dance by these shows. As dance practitioners, we will have our own opinions on the relevance and quality of these shows, but along with all the dance on social media and the introduction of shows like World of Dance, audiences can see some incredibly talented dancers perform; creating accessible and new platforms to showcase dance. While many of the ‘celebrities’ will leave their dancing shoes on the DWTS dancefloor after the show, some do maintain interest in dance, either recreationally, or just through the friendships forged with their dance partners. In the case of Norm Hewitt, (2005 DWTS winner), he went on to become the patron of the New Zealand School of Dance’s Tū Move programme - a unique and inspiring dance experience for young Māori and Pacific Island men aged 14-18. This is all very positive in providing access of dance to wider audiences, but, in the end, I feel it is up to dancers to take advantage of the profile these shows give dance, and to leverage off that visibility to promote and further develop dance in our communities. Original generation time 1.5186 seconds. Cache Loaded in: 0.0005 seconds.